A short section of 1520 mm gauge railway crosses the border from Serhertabat (formerly Kushka) in Turkmenistan to a freight yard at Towraghondi in Afghanistan. 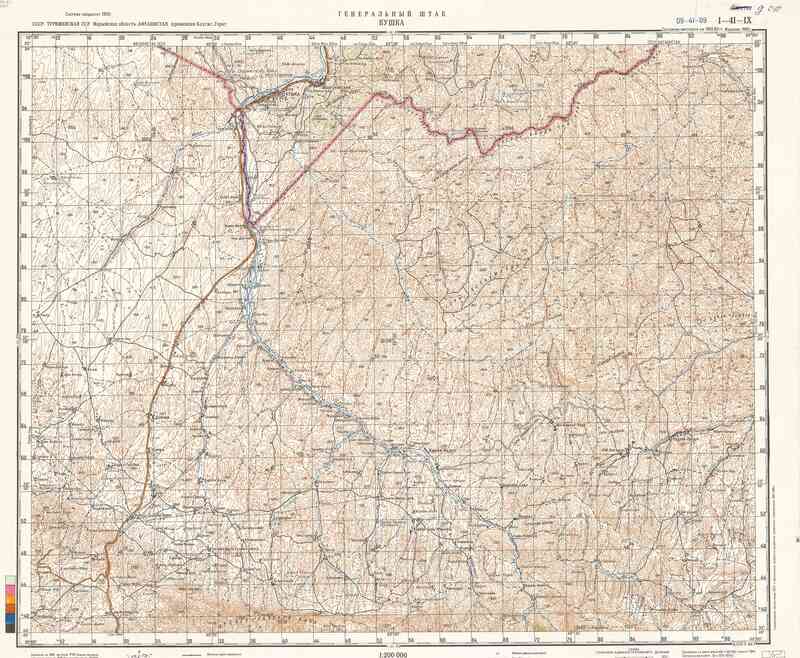 This is the less well known of the two Soviet-built lines in Afghanistan, being in a remote location and carrying less traffic than the line from Uzbekistan to Hairatan. If anyone can offer any information about the opening date, do get in touch. This Soviet map from 1985 shows the railway line from Kushka – Кушка – to Towraghondi – Турагунди. The pink/dotted line is the border, with Afghanistan to the south and west and the USSR to the north. The road and railway run in parallel across the border, with only a short length of railway and some sidings on the Afghan side of the frontier. As well as taking supplies to Soviet forces in Afghanistan after the military intervention in 1979, the railway was used during the withdrawal. The line probably fell out of use with the end of the Soviet intervention, and fell into disrepair. On 11 July 2011 two sleeper-laying ceremonies at Towraghondi in Afghanistan and Serhetabat (the new name for Kuskha) in Turkmenistan marked the start of work to rehabilitate the cross-border railway. 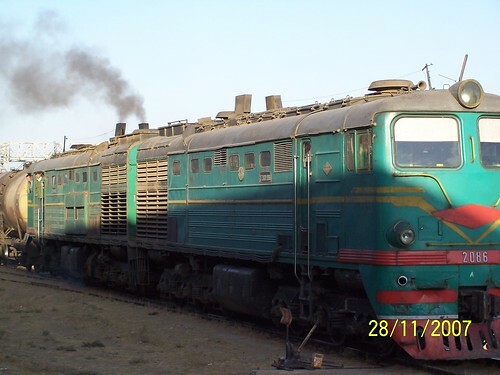 Freight trains across the border and shunting in the yard are handled by Turkmenistan’s national railway as part of its network. Photographs show type 2ТЭ10, ТЭМ2 and ЧМЭ3 (ChME3) locomotives in use. The Turkman rail branch from Mary to Torghundi handles 2/3 full load trains (carrying 46-50 wagons) daily to the very active unloading terminal at Torghundi. Most traffic is imported to Afghanistan but there are also some exports of fruit/vegetable traffic from Afghanistan. Some 60% of the imported traffic is Fuel oil/LPG/petroleum – traffics which are unsuitable for intermediate transshipment. The spelling of the place name in the Latin alphabet is very inconsistent. Here are some variants I’ve come across, and a “Turghondi” road sign which might offer a definitive answer, as much as there can be one. Some photographs by Elfstone44 showing a diesel-hauled train and a derelict carriage at Towraghondi. There are more photographs at the website of Norbert Ratzke of Köln who was in Herat from January to April 2004. He says At the Turkmen-Afghan border a Russian [sic] train runs about 500 meters on Afghan territory. There it is unloaded and returns to Turkmenistan. The pictures show a 1520 mm gauge diesel locomotive (half of a 2ТЭ10Л?) crossing the border, and the freight yard at Towraghondi. News and updates about Towraghondi.